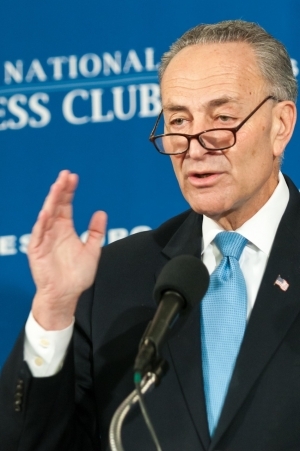 Schumer says Democrats should "embrace government"
Sen. Charles Schumer of New York, the No. 3 Democrat in the Senate, called on Democrats to “embrace government, not run away from it”  at a Club Newsmaker Nov. 25. People are looking for a party that “offers positive and concrete solutions,” but do not want “to be disappointed each time,” he said. “Democrats believe that an active and forceful government can and must be a positive force in people’s lives," he said. "Republicans believe government is detrimental – the less, the better." Another case in point: Voters in Alaska and Arkansas voted to raise the minimum wage earlier this month even as they ousted incumbent Democratic senators who supported such an increase. Schumer said Democrats were wrong to concentrate on passing the Affordable Care Act so soon after winning the White House. “We took the mandate and put all our focus on the wrong problem – health care reform," he said. While voting to expand health-care coverage to millions of uninsured Americans, he said the issue “gave anti-government forces new life.” He said “the average middle class voter thought the Democrats are not paying attention to me” and that wage increases were more important to them. Schumer questioned the Republicans' priorities in the new Congress. When asked if Senate Democrats would demand 60 votes before Republican bills could be brought up for a vote, using the same tactics the Republicans did when they were in the minority, Schumer demurred.